After my original plans for fish and rice were abruptly canceled by a lack of appropriate fish at Whole Foods, I figured I had to make something with the chicken in our fridge. And I knew I had a bunch of Yukon Gold- like potatoes, from my mom by way of Costco (or should that be from Costco, by way of my mom?) along with a gallon bag of green beans, gifted by the neighbors. 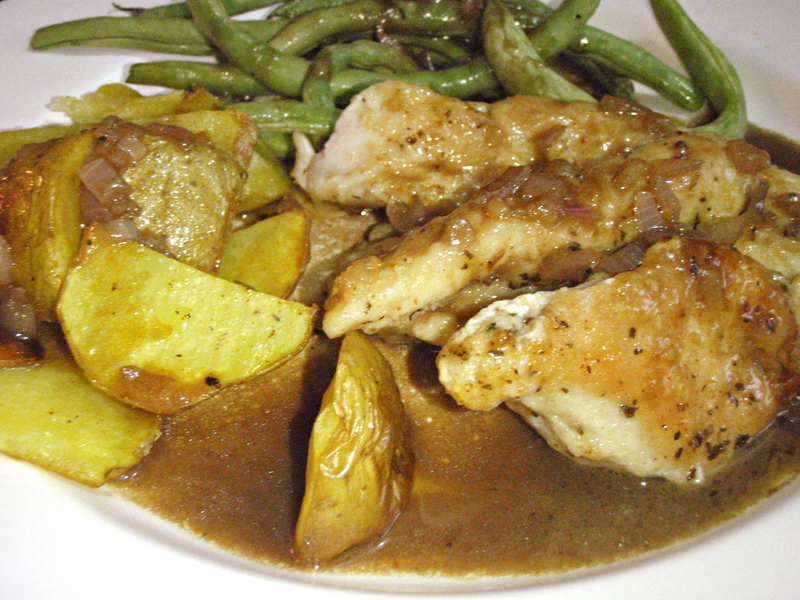 I was going to go with a basic chicken in bread crumbs with boiled potatoes and quick-sautéed green beans. Then I watched Rachel Ray while I awaited the proper time to start so that dinner would be ready about the time Chris got home from Southfield. And RR was making fish, dredged in seasoned flour then pan-fried, and a browned-butter sauce to top the fish. I only saw the last 10 minutes so I had to get on-line to find the actual recipe and FYI, the mobile version of Food TV’s website is a pain in the arse. I gave up and went to the laptop*. Slice potatoes in to evenly sized shapes- I suggest half-moons. Toss with olive oil and salt and pepper. Spread potatoes out in one layer on a rimmed baking sheet. Sprinkle sliced garlic cloves over potatoes. Bake in oven about 35-45 minutes, turning potatoes periodically, until potatoes become golden brown and the whole house smells like roasted garlic. Heat large sauté pan over medium-high heat with 1 tablespoon olive oil. Dredge chicken strips in flour mixture and sauté, turning once, until cooked through. I had to do two batches to avoid overcrowding. Add more oil if necessary. Remove chicken from pan and cover to keep warm. In pan, reduce heat to medium and add 3 tablespoons of butter. “Toast” the butter until the foam begins to turn a light brown color and the butter smells nutty. Do not burn! Add shallots, stirring to coat. Add balsalmic vinegar to pan and increase heat to medium-high, scpraing the bottom of the pan to get up any sticky bits. Once the initial bubbling subsides, add broth and continue to cook at low boil until sauce is reduced. Optionally, whisk in 1 tablespoon butter combined with 1 tablespoon flour to thicken. 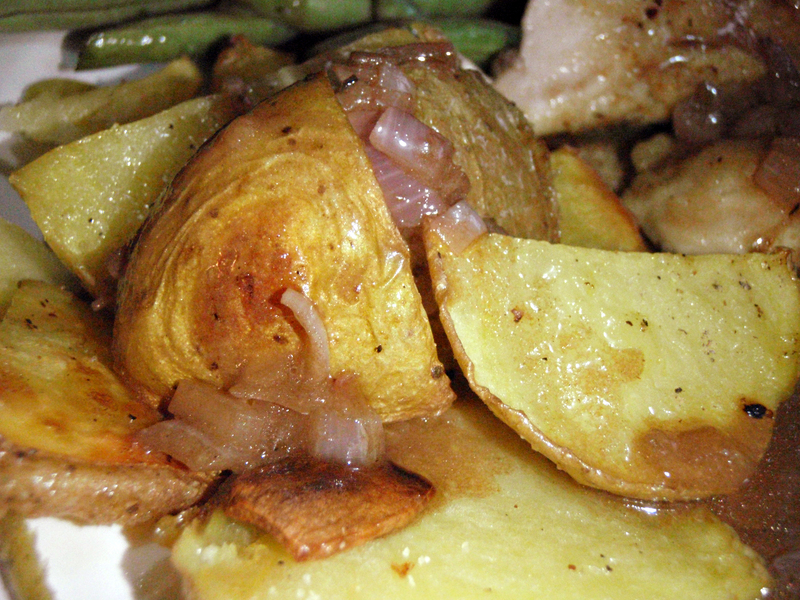 Serve potatoes and chicken with browned butter-balsamic sauce drizzled over top. 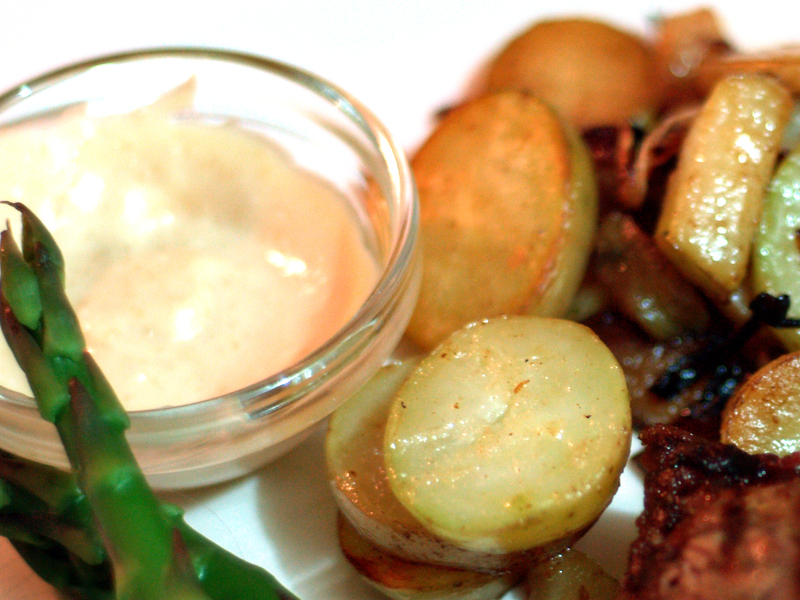 Try not to eat all the best most garlicky, golden-brown potatoes yourself. Unless you are alone. 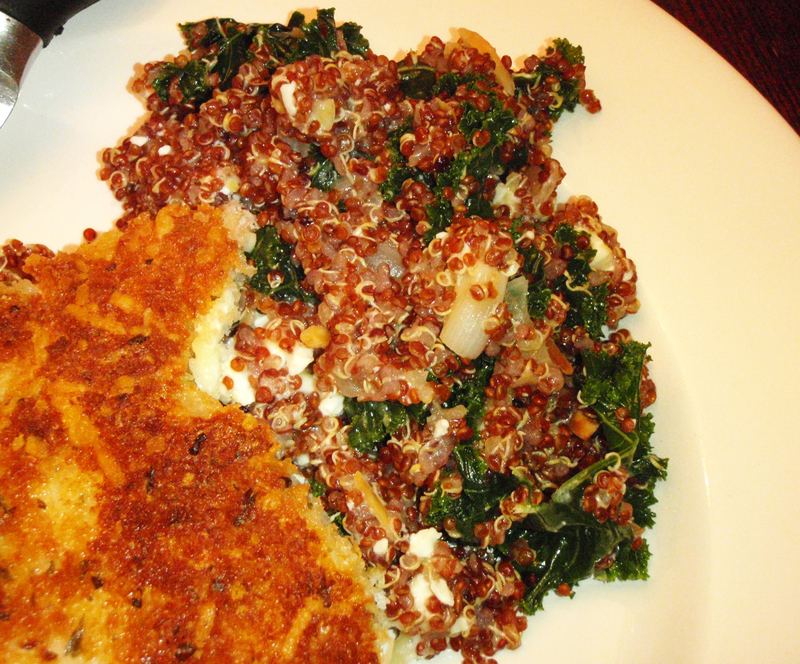 In fact, this might be a good dish to make when you are all by yourself so there is no pressure to share. *This experience is pushing me further towards really wanting to purchase a tablet type computer so I can use the internet for recipes in the kitchen without having to make counter space for my 17inch widescreen laptop or trying to scroll through a recipe on a 2 inch phone screen. Something like an iPad but maybe a wee bit less pricey. I’m curious to try this butter-balsamic sauce on some other foods like say, mashed potatoes or roasted root veggies or just lick it up right from the pan. Be generous with the balsamic- a lot will “burn off” leaving behind the sweet sweet nectar that balances perfectly with the nutty, deep earthy butter. Ever since we at at Quince, way back in October 2008, I’ve been a little bit obsessed with Forbidden Rice. I think about it a lot and plan recipes to use it- I want to show off its purpley-black beauty and the nutty taste that is like brown rice but just a touch sweeter. I’ve made it once since then but not prepared as it was that night with a slightly sweet basil cream. It was good but not quite there. While still not exactly the same, for the last few weeks I’ve been thinking about doing it up with coconut milk and serving that with a nice piece of snapper or mahi-mahi seasoned with a Chinese 5-spice-like flavor plus some heat. After two failed attempts to get fresh fish suitable for this concept at Whole Foods, Chris ended up grabbing a pound of shrimp from Merindorf’s Meats in Williamston instead. Not being privy to the swirling half-formed ideas I had, he didn’t realize that I would have much preferred raw shrimp. I think with raw, higher-quality shrimp (i.e. something from the Gulf, oil-slick free of course), this dish would have been just about perfect. I wrote the recipe here with the idea that it would be with raw shrimp. For the actual dish, I did all the steps described but only heated up the shrimp, rather than cooking them through. The sauce was tasty but the rice was delicious. Using rice cooker, prepare 1 cup Forbidden Rice with 1 cup coconut milk (about 1/2 a can- stirred well! ), 2 teaspoons ginger and a bit more than a 1/2 cup water. This took a little longer than white rice and was right on the edge of being short on liquid but my rice cooker is cheap and doesn’t really do the “warming’ part well preferring to scorch the bottom of the pot so it may have been an equipment issue. Marinate the shrimp with the garlic and 1/2 teaspoon of salt mixed with about a cup of water. Marinate for at least 10 and up to 30 minutes. Drain water from shrimp, keeping garlic. Add finely chopped chilies and lime and 1/2 teaspoon of salt (for more heat, keep the membranes and the seeds from the chilies). Let sit for about 5-10 minutes. Heat oil over medium-high heat. Add shrimp (including marinating juices/garlic/chilies) and cook until just pinked through. Stir in 1/2 can of coconut milk and spicy chili paste (at least 2 tablespoons, more for more heat) plus some tomato paste. I used about 1 1/2 tablespoons tomato paste and it was mostly to thicken the sauce a bit without going overboard on the heat. Serve shrimp over rice with a generous ladle or two of sauce. Garnish with lime zest. 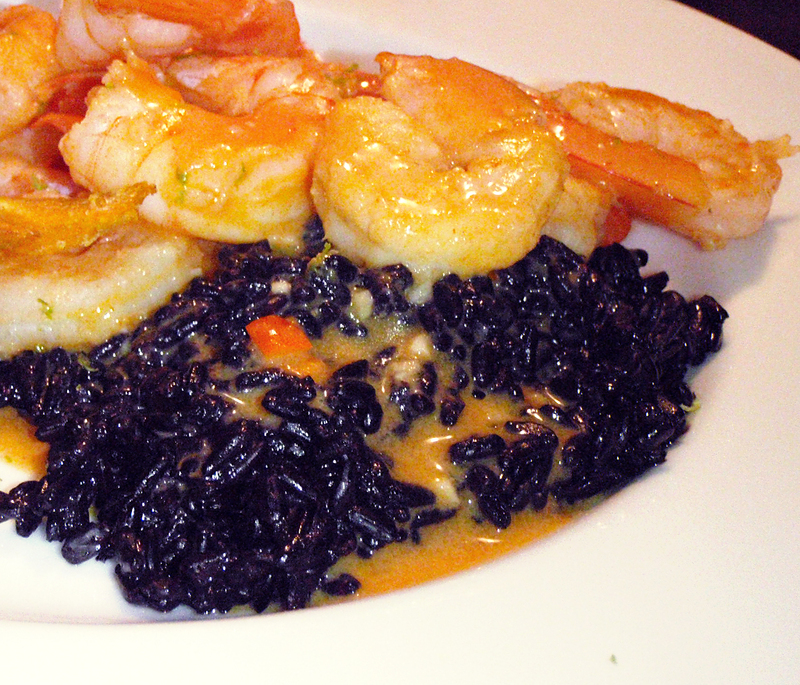 We’ll make this again, next time with raw shrimp to start. Also, I’d probably amp up the heat a bit. With the shrimp already cooked, they didn’t absorb much of the Thai chilies which may have made a difference. Spring has sprung. And with spring comes after-work time spent lounging in the yard and grilling. Yesterday, I stayed in the yard listening to the loudest frogs ever, in our pond, until the mosquitoes came out. Overcast today so less time lounging but we still grilled. Chris was in charge of that- he grilled a hunk o’ meat from Whole Foods (technically speaking it was a NY strip) which had been seasoned with salt, pepper and the ubiquitous maple sugar garlic pepper. I was in charge of sides. Heat 1/2 tablespoon olive oil with 1/2 tablespoon butter over medium-high heat in a large pan. Add onions, garlic and a pinch of salt. Cook until onions begin to brown and crisp up on the sides. While onions are browning, put potatoes in boiling water. Cook until just tender. Remove from water, drain. Add 1/2 tablespoon oil and 1/2 tablespoon butter to saute pan. 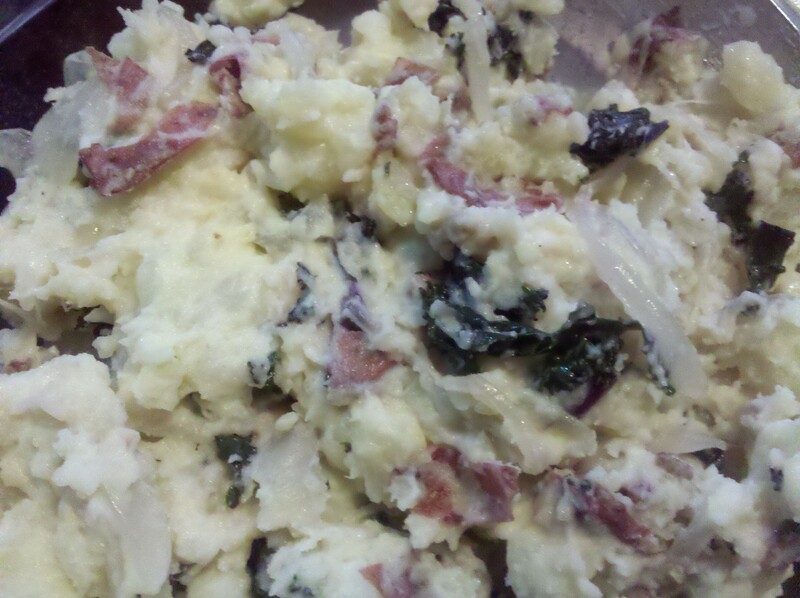 Add potatoes, laying rounds flat so they can get crispy. Meanwhile, add asparagus in a steamer insert to the pot of boiling water. Cook until greened up and cooked through- about 5 minutes for the thick stems we had tonight. 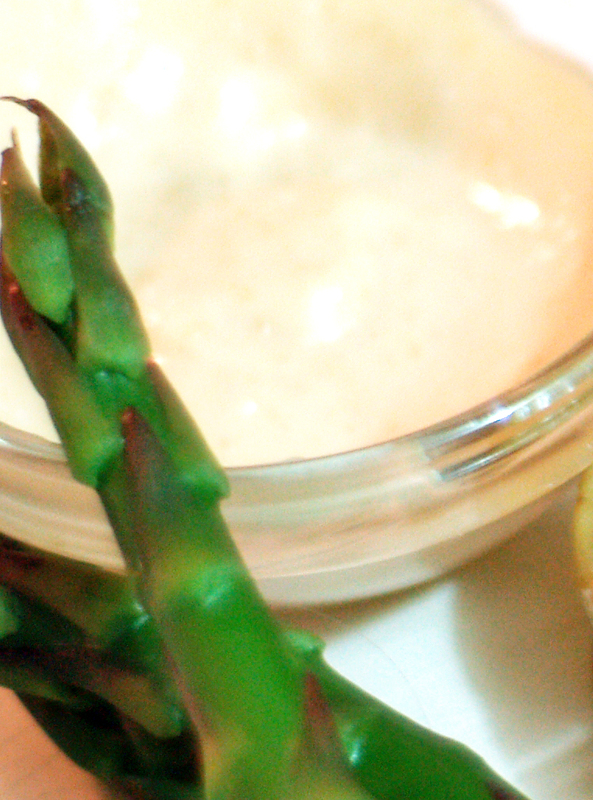 Combine 1 tablespoon mayo with 1 tablespoon smooth dijon mustard and the 2 teaspoons onion powder. Divide in to two cute serving cups (or dollop on the plate). Garnish asparagus with freshly ground pepper and lemon juice. 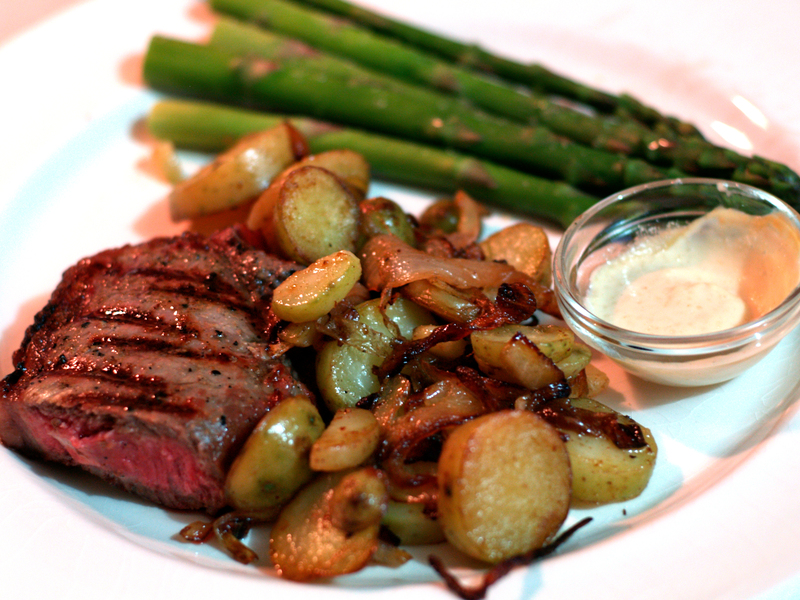 Serve with potatoes and onions and the grilled hunk o’ meat of your choice. The frogs are so loud, we have the TV volume at least 3 ticks higher.